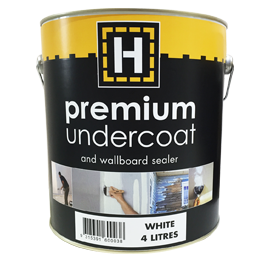 H-Brand premium undercoat and wallboard sealer is a premium quality, fast drying undercoat for the preparation of a wide range of interior surfaces. This acrylic undercoat can be over coated with enamel or acrylic top coats after two hours depending on weather and ventilation. For timber, chipboard, plasterboard, cement render, brick, fibrous cement, rust resisting metal surfaces and previously painted surfaces prior to finishing with either oil-based or water-based top coats. Sizes 1 Litre, 4 Litre, 10 Litre and 15 Litre. Coverage A maximum coverage rate of 14m² per Litre. This may fall below 10m² per Litre when painting corrugated, rough or absorbent surfaces.